What’s so great about Shea butter? Today it’s all about Shea butter, or women’s gold as it’s sometimes called. There is so much to learn about Shea butter, and there’s even the The American Shea Butter Institute that offers a course to become a certified Shea Technician. Though this post is just scratching the surface, there are many compelling reasons to make it a part of your skin care regimen and add it to your soap. Shea butter is made from the fatty extract from the seed of the Shea nut found on the African Shea tree. There are different extraction methods that turn it into thick, solid butter. It is solid at room temperature but melts when applied to the skin. It can be found in many cosmetic products like lotions, makeup, and of course – soap. One of many cosmetic products made with Shea butter. It’s easy to see why it’s so beneficial to use. However, getting the maximum benefits largely depends on which type of Shea butter you use. When it comes to soapmaking supplies, there are two types you will come across: unrefined and refined. Unrefined, or raw, is extracted without chemicals and doesn’t contain preservatives. It has a distinct, nutty smell and thick consistency. It can range in color from ivory to yellow and contains the highest amount of skin moisturizing properties and nutrients. Refined is usually extracted with chemicals like hexane or other petroleum solvents and contains preservatives. It is often bleached and deodorized to make it odorless and white in color. There are some chemical-free refinement methods that use such things as clay or steam to deodorize and remove any impurities. Due to its white color it is preferred by many soapers. It has a thinner consistency than unrefined Shea, but some nutritive properties are reduced or lost from most refining methods. I have used both types directly on my skin and in soap. I prefer unrefined Shea for its deep, lasting moisturizing effects. Shea butter works well when used with other oils and fats in cold process soapmaking. It contributes hardness and conditioning properties to soap. Soapers differ on usage rates so I encourage you to test percentages in your recipes to see what works for you. In the past I have used refined Shea up to 20% . Because it is odorless, it doesn’t mask the fragrance or essential oils in the soap. I love and only use raw Shea now, but I can only add up to 10% or the nutty smell will compete with or overpower the fragrance – even after a long cure. 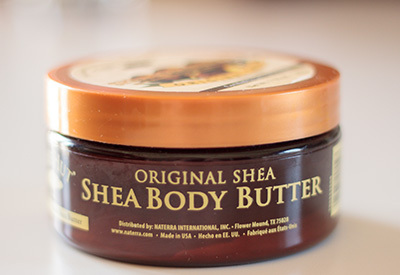 If you haven’t tried Shea butter, then do so! It has wonderful skin benefits and will enhance your soap. All Shea butter is not created equal though. Below is a list of reputable retailers for bulk Shea that I’ve had good experience with and who provide detailed information about their product’s source. For smaller applications you may be able to find it at a beauty supply store, health store, or retailer specializing in African or Caribbean goods. Which do you prefer – unrefined or refined Shea butter? Posted in Butters & Oils and tagged Shea butter, Soap Making 101 on July 3, 2014 by SoapingWithStyle.